On this day 43 years ago, Himitsu Sentai Gorenger debuted in Japan as the very first Super Sentai team (though simply referred to as a “Sentai” team until 1994 when it officially became listed as “Super Sentai” with the current series). On April 5th 1975, Himitsu Sentai Gorenger aired in Japan marking the beginning of something no one could ever predict. Super Sentai managed to survive the brink of cancellation more than a few times to bring us some of the most memorable tokusatsu stories and characters for over four decades. And of course – without Super Sentai there would be no Power Rangers. With the advent of the Mighty Morphin Power Rangers, using adapted footage from Kyoryu Sentai Zyuranger, Power Rangers took the Japanese Super Sentai worldwide with an American spin on the stories that exists till this day (and celebrating it’s 25th Anniversary). 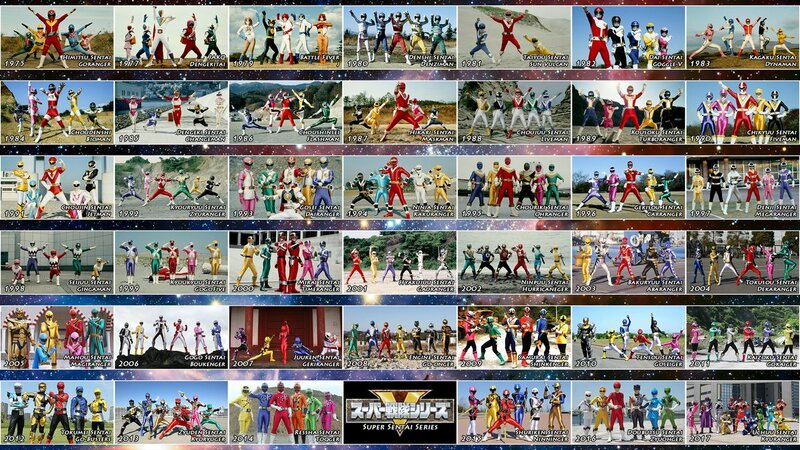 Please join our anniversary thread and share YOUR favorite Super Sentai series and characters and villains! It’s incredibly rare for properties and shows to last more than a handful of years. For Super Sentai to last 43 years is quite a feat worthy of celebration! Story image courtesy Nobuharuudou on Deviant Art. Check out their work! Happy 43rd Anniversary, Super Sentai! What are your favorite teams/characters? And also my all time favorite Sentai villain AND hero, Kurojishi Rio~! Thanks, Sentai, for giving me some great moments. The ending of ToQGer, KyoryuViolet (both of them), Beet J Stag, Larry the Spanish Gorilla, the BN thieves, and pretty much all of Akibaranger. I can't pick any favorites. I like too many in general. Let's take it back to Gorenger that started it all for without it this thread would not exist. JAKQ held the fort and gave us the Chuck Norris of commanders later on. Battle Fever J perfected it. Denziman gave us the first henshin item and a craving for anpan. Sun Vulcan gave us a kickass theme song and our first animal themed costumes. Goggle V gave us Haruta and that showed us ancient civilizarions and gymnastics can work somehow. Dynaman gave us Haruta again and spandex. Bioman gave us an awesome streamlined robot and Hakaider 2.0 painted in silver. Changeman gave us the first Kageyama sentai song. Flashman gave us two robots. Maskman gave us a remake of that Tom Cruise and Tim Curry movie. Liveman gave us two robots combining into one. Turboranger gave us our first Heisei sentai team. Fiveman gave us the first family sentai. Jetman gave us a high quality soap opera in the disguise of a super sentai show disguised as Gatchaman. Zyuranger gave us the source for Power Rangers and the official first tsuika senshi who piloted a jrpg themed Mechagodzilla. Dairanger gave us kung fu and Daijinryu. Kakuranger gave us Kane Kosugi. Ohranger gave us King Ranger. Carranger gave us a hilarious good time. Megaranger gave us video game rangers. Gingaman gave us our first gorilla robot. GogoV gave us our first solar-powered robot. Timeranger gave us Time Fire. Gaoranger gave us many combinations of robots. Hurricanger gave us Gouraiger and Shurikenger. Abaranger gave us Abare Killer. Dekaranger gave us a red ranger who knows gunkata. Magiranger gave us a tsuika senshi Aladdin who ditched the magic carpet for a magic train and had a cat genie. Boukenger gave us monsters based off of previous super sentai bots. Gekiranger gave us cats and Bruce Lee tracksuits. Go-onger gave us our first chicken motif ranger. Shinkenger gave us our first sushi chef ranger and a badass red ranger. Goseiger gave us robocop as a tsuika senshi. Gokaiger gave us so many Gokai changes. Go-busters gave us a drunk robot. Kyoryuger gave us 10 rangers, samba dancing, and Ramirez. ToQger gave us episode 3. Ninninger gave us a burger that can take selfies and transform its user into a golden cowboy ninja. Zyuohger gave us a three-in-one discount and minecraft megazords. Kyuranger gave us 12 rangers and yossha lucky. Lupinranger vs Patranger gave us two teams to root for. In conclusion I love Liveman for the awesome story, Carranger for their shenanigans, and Shinkenger for having an awesome cast + cool designs + sushi chef. Oh and whatever this year's team is. Best Super Sentai is tie between Zyuranger/MMPR S1 and Gokaiger/Super Megaforce. Thanks! Was literally about to look up the date of the originals for other reasons. So far, my favorites are Geki, Go-buster, and scattered other bits. Loved some elements of Bouken. Kyu is pretty awesome too. Go-Onger was straight up fun. Dancing closing theme ftw. But I'm probably biased towards everything that came out over the past 15 years, and looking forwards to the Toku genre resurgence like we started to get in the mid to late 2000s. Mecha design though, the original Dragon Caesar still stands out as my all time favorite design elements. I've only seen Zyuranger, Dairanger, and (unofficial Sentai) Akibaranger. But if I had to pick one of them I'd say Akibaranger is my favorite. I really like the show and all the characters a lot. The Villain Malshina was amazing, smart, and gorgeous. The store owner/Doctor/Director was also a great character. Just great all the way around. Very good, very meta and self-aware while still being a great Sentai show.